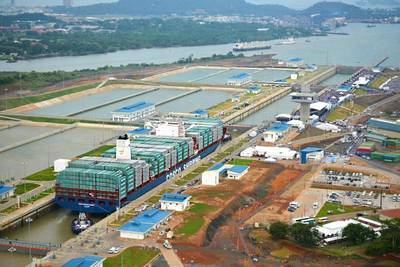 The Chinese giant Cosco Shipping has made the inaugural transit on Sunday June 26, 2016 through the expanded Panama Canal expansion project , event appreciated by thousands of people in Agua Clara lock province of Colon. Spectators watch as the Neopanamax cargo ship, Cosco Shipping Panama, makes its way through the new Agua Clara locks, part of the Panama Canal expansion project, near the port city of Colon, Panama. The container vessel had set sail from the Greek Port of Piraeus today on its way to Panama to make history. The ship carrying more than 9,000 containers entered the newly expanded locks that will double the Panama Canal's capacity in a multibillion-dollar bet on a bright economic future despite tough times for international shipping. The inaugural ship, Cosco Shipping Panama is a 158-foot-wide (48.2 meters), 984-foot-long (300 meters) behemoth that is one of the modern New Panamax class of mega-vessels that are seen as the future of global shipping and will now be able to use the canal. It carried some 9,000 cargo containers during the inaugural voyage and now heads to South Korea. Originally named Andronikos, the vessel was renamed by China COSCO Shipping to pay respect to the people of Panama and for the honor of the inaugural transit. This ship was selected during a draw for the inaugural transit through the expanded waterway. 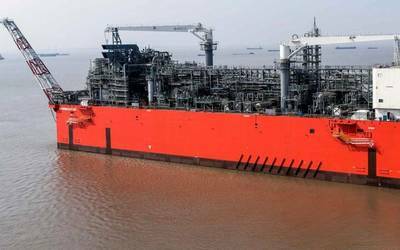 Coincidentally, the ship was built in Hyundai Samho Heavy Industries Co., Ltd, the same company that constructed the valves that control the flow of water through the new locks of the Canal.